Love this Quilt !! It is not too heavy (I got the lux, cal. king) (It's huge) It stays put. It breaths. I'm always hot and hubby is cold, the Cumberland works for both of us. Quality is Great and colors are bold. Flip side is a warm color plaid, really sofy flannel. I love it ! and if your into "Grey" it also has that in it too ! Quality ...That's what I was looking for ! 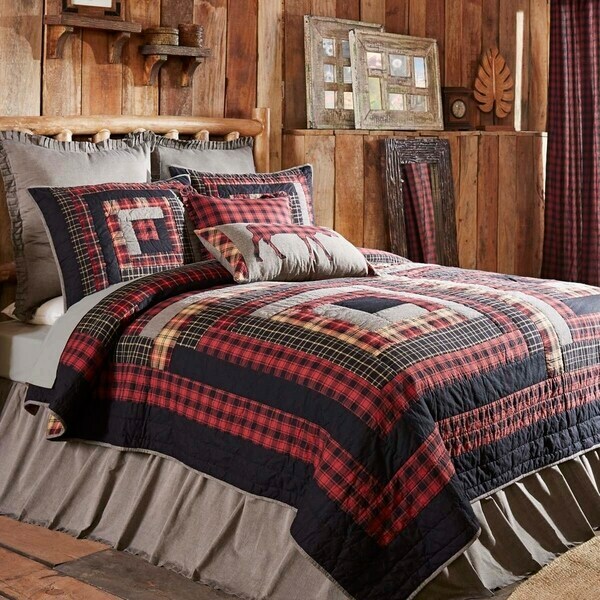 Bring log cabin charm into the home with the Cumberland Quilt. Chili pepper reds, caviar blacks, and natural tans make the Cumberland Quilt a woodcutter's dream. Dimensions 115.0 In. X 130.0 In. X 1.0 In. This product is exactly what I was searching for. I love that the red is red and not burgundy and the grey is grey. My home is a farmhouse and I tend to decorate with that in mind, a tad bit of rustic added. Our room has a dark grey wall with the rest being soft white, it's perfect! We like it cool so the quilt is just the right weight, not too thick or thin. It seems sturdy and if that changes, I'll let you know. I would recommend it. Very nice quilt. I like that it's cotton. My boys like the buffalo plaid, and this quilt has just enough of it. Also, it looks nice for a wood-sy style without being overly rustic. Love the quilt. Colors are true. Good size. Light weight, true to colors on the picture. Washes well. Love this so much! Perfect! "What are the dimensions on the California king, it’s says 2 different dimension in 2 different places"
California King dimensions are: Weight: 10.5 (lb). Dimensions: L105xW120 (in). "Do you have the bed skirt and euro shams shown on the picture? I need size queen"